First of all sorry for my english, I'm french. I have bought a Concept2 model D last week. I was used to this indoor rower because this was the model in my previous sport hall club. First to days was normal, and today, I have a strange noise when not rowing hard. I feel like this is probably coming from the rower's chain but not sure. As this is hard to explain noises with words, here is a 1min record of the noise. Note that my smartphone was placed on the rower, so it amplifies the effect I'm trying to share. As the rower is new (less that 4 hours of use) I'm not convinced it already need to have lubricant on the chain. Are you asking about the intermittent squeaky sound that sounds like a little bird? Or the lower rumbling sound? You won't be disappointed by the C2 rower - as you probably already know, they are great machines for a great workout. "Lubricate the chain with a teaspoon of purified mineral oil, 3-IN-ONE® oil, or 20W motor oil. Apply oil to a paper towel, and rub the paper towel along entire length of chain. Wipe off the excess. Repeat if needed. Do not clean the chain with any kind of cleaner or solvent, e.g. WD-40®." Hi here is the answer of the official Concept2 Support. It solved my issue so I share in case this can help. Based on the audio file you sent, I think the chain idler pulley on your machine is squeaking as it rotates around the small axle shaft that runs through the middle of it. This noise can be a little disconcerting, but it is not a sign of a bad problem on the machine that is going to get worse and cause a big failure. The noise may go away as you use the machine more over time. Get a small container of lightweight machine oil, such as 3-In-One multipurpose oil (available at hardware stores all over the place), sewing machine oil, or similar. Note that you'd also use this oil for chain lubrication (https://www.concept2.com/files/pdf/us/i ... cation.pdf), which is an important regular maintenance procedure on the machine too. Once you have separated the machine, set the monorail/seat/rear leg end of the machine aside, and stand the front end (flywheel) section up on end (flywheel down on the floor, foot stretchers up in the air). 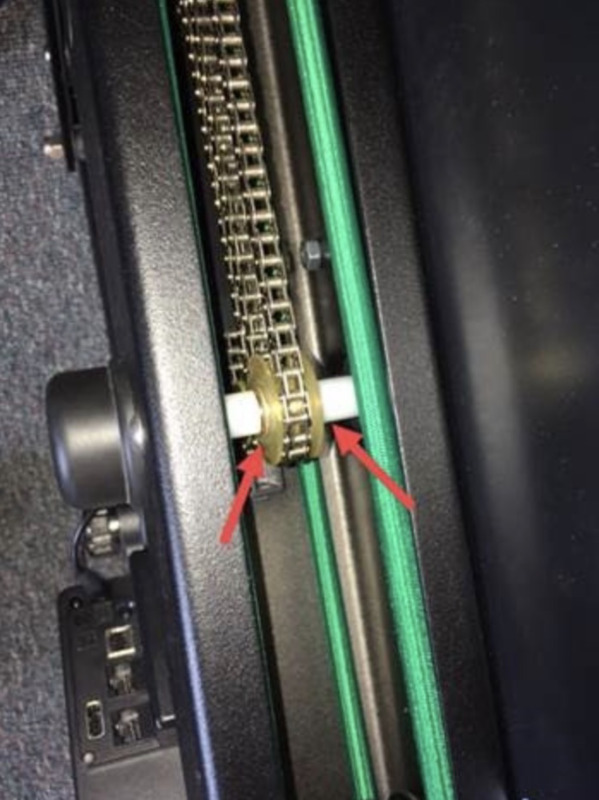 Remove the white plastic return mechanism cover that blocks your access into the inside of the machine by grabbing it up high in between the foot stretchers and pulling it up and out. The chain idler pulley will be just about exactly 8” above floor height with the front end standing up on end. There is a white plastic spacer on either side of the pulley to keep it centered on the small axle shaft that runs through the middle of the pulley. You should be able to shift the pulley to one side a few millimeters to open up a gap between the spacer and the pulley. Get a few drops of oil into this gap so that it ends up inside the brass bushing that is at the center of the pulley where the small axle goes through, then shift the pulley to the other side to open up a gap there and apply a few drops of oil there too. You may find this easier to do if you turn the front end completely upside down on the floor (make sure to fold the monitor arm all the way back behind the flywheel to protect the PM5 Monitor). See image below for where to aim the oil. There are two of these idlers in the rower, oil them both. This is problem that usually shows up years later as the rollers are dry assembled, there is no lubrication on them because in theory the phosphorous bronze bearing in the roller as some self lubricating properties when used against the steel pin. I used synthetic motor oil on mine. I put drops on the end of a small screwdriver as its pretty hard to get the oil in the right place and control the quantity applied.